Cliff Cycad or Limestone Cycad is abundantly grown on near-vertical cliffs and limestone outcrops in full sun and often with no soil at the roots. Such a pity that being abundant, this popular and ornamental palm is pilfered and pried from their natural habitat by unscrupulous collectors and then sold to home gardeners. 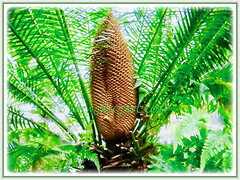 Botanical Name: Cycas clivicola (syn. : Cycas clivicola subsp. lutea, Cycas clivicola subsp. clivicola). Common Names: Cliff Cycad, Mountain Cycad, Limestone Cycad. Etymology: The specific epithet clivicola is derived from the Latin clivus, meaning a cliff, and the Latin suffix -cola, for dweller, as this plant usually grows in cracks high up in vertical limestone cliffs. Origin: Native to the limestone outcrops in Cambodia, Thailand, Vietnam and northern Peninsular Malaysia, as well as common on offshore islands. 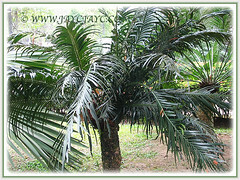 Plant type: An ornamental and perennial palm. 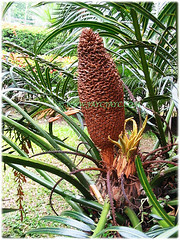 Features: Cycas clivicola is from the genus Cycas that consists of about 113 accepted species of flowering plants. However, Cycad clivicola is fairly clear a single species. 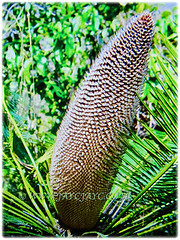 It is a slow-growing and medium sized cycad that reaches about 8 m in height with a tall and narrow trunk. The smooth 10-16 cm diameter trunk has a nicely rounded base and generally pale grey in colour. It is topped with 0.7-1.7 m long leaves that are slightly glossy, often terminated by a 2-15 mm long spine. The leaves may vary in colour with age from grey-green when young to bright green once mature. Leaves are held on 15-55 cm long petioles that are armed with spine 10-80% of its length. It has 9-26 cm long and 5-11 cm wide median leaflets that are covered with white tomentum shedding as leaf expands. Rachis frequently terminated by a 2-30 mm long spine. The 5-8 cm long cataphylls or modified leaf are narrowly triangular, soft, pilose and articulated. 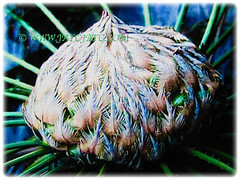 It is dioecious with male and female cones found on separate plants.Female cones with sporophylls 12-22 cm long and densely yellow to grey tomentose, 12-22 cm long with the end flattened to form a broad orbicular surface 7-14 cm long and 6-9.5 cm wide. Male cones are solitary, narrowly ovoid, yellow to brown or green in colour. They measure 25-50 cm long and 8-11 cm in diameter. 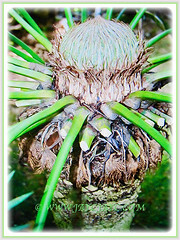 Sporophyll face 10-15 mm wide, apical spine prominent and sharply upturned or gradually raised, 5-16 mm long. Sporangia in a single patch. Large seeds are flattened-ovoid, 3.5-5 cm long and 2.6-3.5 cm wide with a fleshy coating and a hard centre. These are produced on the leaves. Sarcotesta is orange to yellow in colour, not pruinose and 3-4 mm thick with fibrous layer present. These captivating palms are most often rooted precariously in crevices of near-vertical cliffs and limestone mountains. Hence, given the common names, Cliff Cycad, Mountain Cycad and Limestone Cycad. 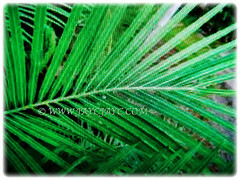 Culture (Care): Cycas clivicola or Cliff Cycad can be grown easily with least maintenance. Light: Grows best in full sun though best with some protection from afternoon heat when young. It can do well in semi-shade too. Moisture: Medium water requirement. It is drought-tolerant. Soil: Humus-enriched, loamy, alkaline and well-drained soils. However, it is adaptable to a wide range of soil types. Others: Remove spent or withered fronds to keep it tidy and aesthetically appealing. Because of its growth habit, fertilize only when terminal bud begins to swell, indicating the start of the annual growth cycle. Once every quarter, feed the palm with a slow-release granular fertiliser formulated for palms that has nitrogen, phosphorous and potassium. Generally, it is free from serious diseases and pests. Nevertheless, watch out for the weevils or beetles, scale insects, mealybugs, aphids and spider mites. 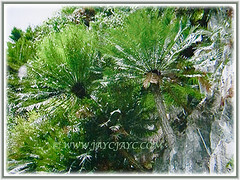 Cycas clivicola or Cliff Cycad exhibits good cold tolerance, so short periods of near-freezing temperatures should not be expected to be overly dangerous to the health of this beauty. In non-hardy regions, best to grow this beauty in a container to easily bring indoors to overwinter. It can be grown as a houseplant in a greenhouse or conservatory with the right growing conditions. Propagation: Propagated from seeds that germinate in about 6-18 months. Advisable to store the fertile seeds for several months before the inner embryo is ready to germinate. 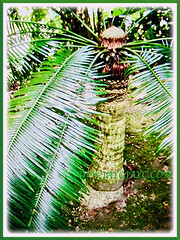 Usage: Cycas clivicola or Cliff Cycad is most ideal as a landscape tree in the public park and garden. Lovely too when planted along median strips. It makes a fine accent or specimen plant in a garden. Suited to be grown on the ground or as a container plant. Its resemblance to palms will add a tropical touch to any landscape. 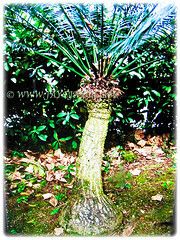 It can be carved as a bonsai cycad. Their roots contain cyanobacteria that exist in a symbiotic relationship with the plant and provide it with further nutrients by converting atmospheric nitrogen into a usable form. The roots are also retractable for protection against drought and fire.